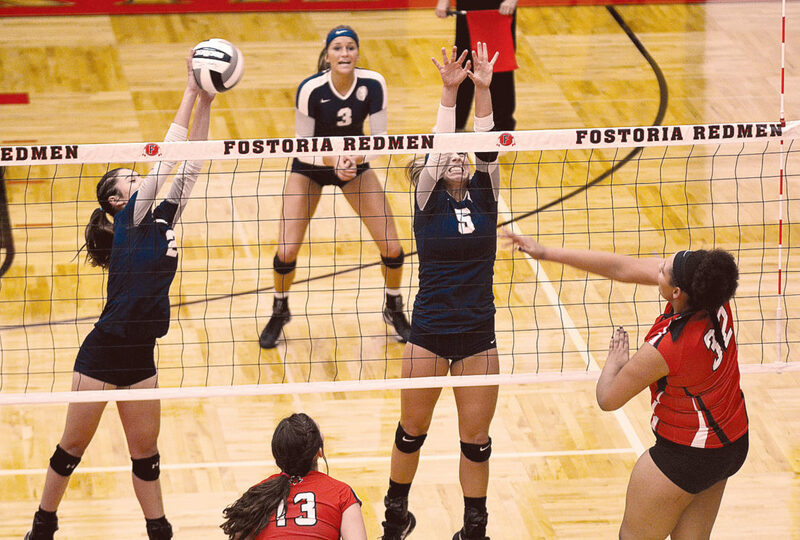 PHOTO BY JILL GOSCHE Carey's Mckenzie Row (left) and Hannah Zimmerman team up at the net during the district volleyball match against Arlington in Fostoria Thursday, as teammate Sydney Kin (3) looks on. In his postmatch interview, Carey coach Eric Vackert kept going back to Game 2.The Blue Devils’ season ended Thursday night in the Division IV district finals in Fostoria, with Carey losing 23-25, 25-22, 25-15, 25-17, to Arlington. The Red Devils, who finished the season as the state’s fourth-ranked team in Division IV, won a district title for the first time. Vackert said he thought Carey had a chance at the upset, and might have pulled it off. “I really thought if we’d won Set 2, we might have won the match,” Vackert said. Carey played a strong first game, never trailing Arlington by more than two points and never leading by more than three. With the score tied at 23, the Blue Devils Sydney Kin delivered back-to-back kills to clinch the Game 1 win. Carey kept the momentum when Game 2 started, scoring the first three points and jumped out to a 7-2 lead. 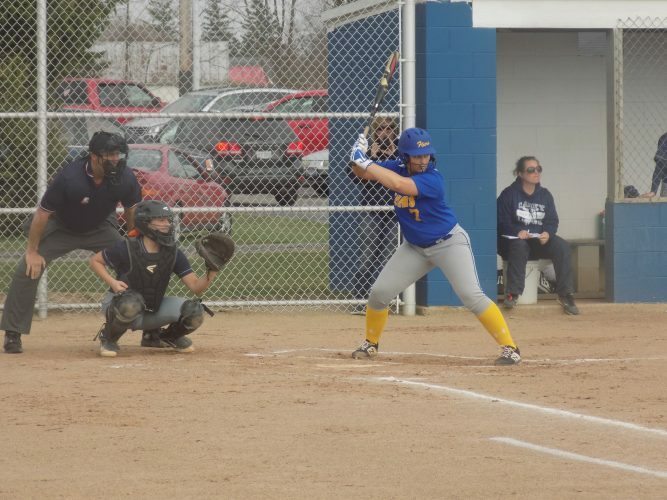 The Red Devils answered Carey’s early spurt with a 10-5 run, tying the game on an attack error. The game see-sawed from there, until an ace from Kendra Jolliff, followed by an Alex Russell kill, gave Arlington a 23-20 advantage. Carey’s Hannah Zimmerman answered with two straight kills, but that was it for the Blue Devils’ offense in the second game.And from there, Arlington took over. In the third set, Arlington jumped out to a 6-2 lead, and never looked back, holding at least a three-point advantage the rest of the way and breaking it open late. The fourth game was more of the same. with Carey trailing just 10-9 before Arlington broke it open again, using back-to-back Jolliff kills to extend its lead. Lauren Willow — who set the Arlington record for kills in a season with her performance Thursday — finished with 17 kills. Hannah Willow had 11 kills, Whitney Dodds added 25 digs for the Red Devils (23-2) while Alex Russell had 19 digs and Alyssa Jordan had 15 digs. Kin led the Blue Devils with 10 kills, 24 digs and two blocks. Zimmerman smashed nine kills and two aces, while Mckenzie Row had seven kills. Jenna Smalley dished out 22 assists while collecting 14 digs. Dana Worst also had 14 digs, while Anna Smalley had 15. Jessica Johnson served two aces. Carey ended its season at 19-7, and was district runner up for the second-consecutive year.